OK, that was a poor attempt at a Reservoir Dogs reference. Yeah, I know. I need help. In my defense, I received a package from the anointed "Nice Guy" of the card blogging community, Kevin. What say you? You don't know about Kevin? You're joshing me? Well, head on over to The Great 1965 Topps Project and Orioles Card "O" The Day and get to know him. While you're at it, head on over to NumerOlogy. It's OK, I'll wait. There. Don't you feel better now? It's always good to visit some top notch Orioles sites and a 1965 Topps site! I sent some cards over to Kevin awhile ago. Kevin is one of the few bloggers that I will just randomly send stuff to. I guess it goes back to our early connection in the community. I try to look out for things for everyone, but sometimes that's impossible. A select few in the community have been so successful with trading, that I don't expect anything in return. I know that someday, in some way, a package will arrive out of the blue. Kevin is one of those people. Let's see what Kevin sent over. Back when I went to school with Rob Mackowiak, I never thought I'd be seeking his autograph out, over a decade later. It's funny how things work out. You never know who is going to grow up to be famous. Kevin and I share a love of Harold Baines. Harold spent a lot of time with both of our teams and is well loved in both towns. Thank you, Kevin. These cards are awesome! Plus, I love the Ozzie box bottom! You are truly the nicest guy in the community. Continuing with the packages that arrived when I was offline, comes this package from reader Boog. Yes, I swear that I'm almost done with these. I like to acknowledge everyone that takes the time to send off a package. The downtime just really screwed my rhythm up. Here are some cards from your want list. Thanks for doing such a great website! Well, I try, Boog. I try. There will be some cards coming your way, sometime in the near future. I'm slowly getting back to normal over here. Yeah, I know I keep saying that. It's true though! Thanks to the kind generosity of Boog, there are seven cards that I can take off my want list. Let's see what Boog sent over. The cards may be few, but they pack quite a wallop! All are off of my want list and that is huge! I can appreciate a few cards off of my want list more than a whole bunch of cards that I already have. It's just easier to love that way. Not that I don't still appreciate the duplicates. Thanks, Boog! This was a great treat! I hope to return the favor soon. The world of Chicago Bulls basketball is reeling. 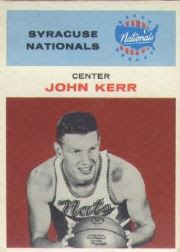 Not only was Norm Van Lier found deceased yesterday, but Johnny "Red" Kerr lost his battle with prostate cancer yesterday. While Johnny's death was expected, that doesn't make it any less of a tragedy. His death came mere hours after the discovery of Norm Van Lier. I can't think of another day in Chicago sports history where two people so intertwined in the fabric of a team died within hours of one another in unrelated circumstances. At least Johnny was able to hold on long enough for a public tribute to him on February 10, 2009. He was given the John Bunn Lifetime Achievement award at a halftime ceremony that day. In his first year of coaching, Johnny led the first year Bulls franchise to a playoff berth. 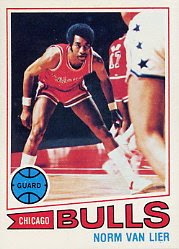 In doing so, the Bulls became the first team to make the playoffs in their inaugural year. As a result of that magical first season, Johnny won the NBA Coach of the Year in 1967. On a day where the current Bulls player were meeting with President Obama, two Chicago Bulls legends quietly slipped away. While this is a great day of mourning in Chicago, we should be grateful that we allowed both of them to become so dear to our hearts. Somewhere, yesterday, Norm Van Lier was awaiting Johhny "Red" Kerr's arrival with a hand full of talcum powder. Hope springs eternal and Spring Training brings eternal hope. Josh Fields seems to be taking that message to heart, so far. He has improved on every aspect of his game in the offseason, resulting in a better bat, better fielding and better speed. If Josh can keep these improvements up, he has an excellent shot at being the everyday third baseman in 2009 and keeping it throughout the season. Gone are the fallback options of Joe Crede and Juan Uribe. That doesn't mean that third base is a cakewalk. There is fierce competition. New acquisitions and signings are there to take away this opportunity for Josh. It should be interesting to see how he responds through the rest of Spring Training. The job at third base is his to lose. There are plenty of options behind him that are viable. Let's hope that this, in combination with his offseason training program, are enough to light a fire that won't go out until November. While 2008's version of First Edition didn't pan out much, the 2007 version caught my eye right away. I had just gotten back into the hobby and was sampling everything in sight. I enjoyed the design of First Edition more than the regular Upper Deck set. The gold border seems to go with the design of the card much better than the silver on the regular set. While Topps was the first pack that I bought in 2007, Upper Deck's First Edition became my early favorite and has stayed with me ever since. It was this set that solidified my re-emergence in the hobby. This was the one card that I was most excited about. So long Stormin' Norman. Chicago sports will not be the same without you. News of his death hit the airwaves in Chicago like a tsunami. All afternoon, I have heard mournful tributes on the radio and on television. There are very few players that can be instantly identified with the Bulls, have a decades long history with them and still take every move personally. Norm Van Lier hit all of those cylinders and more. There was no one harder on current Bulls players when they were slacking and there was no one who celebrated each victory more than Norm. Basketball and the Bulls were in his lifeblood. Chicago sports and the Chicago Bulls have lost a unique and passionate man, who deeply cared about the sport. You will definitely be missed, Norm. To make that Mick Kelleher card, this is the photograph I had to work with, complete with big, bright and bold blue autograph. Yeah, I never thought I'd get it off of there either. It just goes to show that when there is a will, there is a way. To get another view of the completed card, go over to Johngy's Beat, since he is the one that commissioned the card. I hope he is successful in getting the card autographed! Another package that arrived at my mailbox was from Jack at All Tribe Baseball. Jack is better known as Baseball Dad. Not only did the package contain a small sampling of some great oddball cards, it contained a mystery. I found a card of Frank Thomas that I cannot fully identify. I'm guessing that it was a Louisville slugger promo, but I can't find any information on this card. Not even a year! So, I am left to depend on the kindness of strangers and fellow bloggers. Does anyone know what the story behind this card is? I've included front and back scans for any help in the identification process. I think that it's really cool that I have found a card, that is supposedly not bootleg, that I can't identify. The second coolest part of the package came in the form of 32 year old discs. I had never seen the Burger Chef discs in person, but here are four of them. How cool is that? But the best part about these discs is the back of them. Yeah, it's cool to see Richie Zisk in a Pirates hat with no logo, but these cartoons make the disc! Let's see what goodies came in this package! 28 - Sandy Alomar Jr.
17 - Ken Griffey Jr.
161 - Ken Griffey Jr. Awesome. 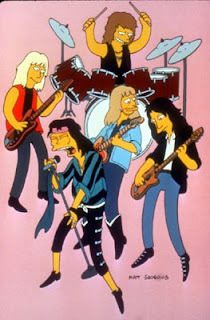 Simply, awesome. Thank you so much for these cards! They mean the world to me! I will look over your want lists and send something out very soon. If I hadn't said it before, welcome to the community! This is a special request from Johngy of Johngy's Beat. He asked if I could make a card of Mick on the Cardinals, from his early playing days. Mick's first Topps card was with the Cubs in 1977. He also has a card in the 1976 SSPC set, showing that the competition against Topps was a good thing. 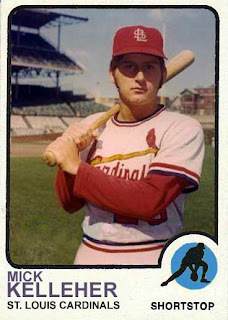 The only problem was that Mick made his debut in 1972, with the Cardinals. He also played with them in 1973 and 1975. He played enough in 1973, that it could be argued that he would have been eligible for a card in the 1974 set. So, I decided to make the card a 1973 Topps card. It would realistically be the first card that Mick could have had. The main problem with this project was not the lack of a photo. Johngy provided a great looking photo for the project. The problem was that Mick had signed the photo in bright blue ink boldly across the middle of the picture. Topps did not have fake signatures on their cards for the years that I could have used, so the signature, while beautiful, had to go. John, I hope that this meets your expectations. It was fun to do. Thanks for the challenge! Eventually, I will catch up to all the generous packages that arrived when I was offline. One of the most unique envelopes contained a pack of cards. What's so unusual about a pack of cards? It was not available in stores. It was only available at the whim of a mastermind. These are Phungo Cards! The packaging had Jamie Moyer on the front and shouted out to look for Black Frame Inserts and "Traditional" Cards by Topps, Upper Deck and Fleer. This was an eight card pack, but I believe I got a bonus. Unlike "Traditional" packs, the stealth inserts do not take away a card from the pack. This would be the first non store bought pack of cards that was labeled 2009. This beat my "Traditional" packs by at least a week. Let's rip this sucker open! The first card I encounter is the stealthy Black Frame insert. It is a beautiful picture of Chicago along Lake Michigan taken on July 31, 2007. I might be somewhere in that photo obscured by some building or just distance. It was taken two weeks after I got back from a trip to St. Louis. What more can I say about this pack? It is one of the most unique pack of cards that I have ever received in the mail. This is such a thoughtful gesture and such a joy to look at that I almost feel guilty having to suppress it for so long. Thank you for this truly wondrous experience! OK, maybe not the first of the blogging community, but my first 2009 Upper Deck blaster. That's got to count for something... right? It may only be important to me, but here it goes. The card of Juan Uribe that you see in this post is the lone White Sox card pulled from the blaster of ten packs of 2009 Upper Deck. I'll let that sink in for a second. Every other team was represented well. 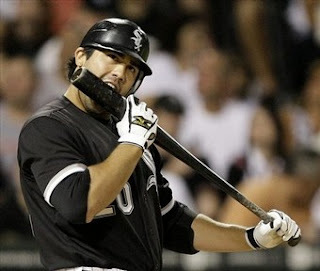 I get a great action shot of a former White Sox player. It could have been worse. I could have gotten no White Sox cards. I am eternally grateful for the one card and plenty of trading fodder. There weren't even any current White Sox players on other teams in there. Just Juan Uribe and a couple of ghosts from the 2005 World Series team. Frank Thomas and Aaron Rowand were in full force, both popping up near the end of the journey. I have both of Juan Uribe's cards from both flagship sets, in my first attempt at collecting in the new year. You know what this means, don't you? Juan Uribe will be the National League MVP of 2009. Stranger things have happened. Upper Deck has the opposite effect on me. I think the cards look fantastic on the computer images, but in my hand is a different story. The cards look tired and listless. The design seems lazy with the same picture cropped to a head shot on the back. Maybe the design will grow on me, like last year's. Hey, I'm just happy that there was a White Sox card in there somewhere. Five packs in, first card, still is in the thick of it all. Very complicated apparently. I bought one 2009 Topps retail pack and two 2009 Topps retail rack packs. I figured that this would equal a blaster roughly and that being from two different sources, it might mix things up a bit. Out of the retail pack came this. 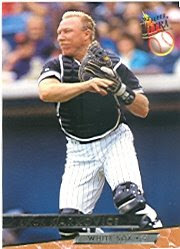 OK, this is the first image of a White Sox player and the player is noted on the card. It's not what I was expecting though. The card is a multi-player and multi-team effort. It's nice though. The design of the 2009 Topps cards look much better in person than they do on the computer images. No further White Sox related card yielded from the retail pack. On to the first rack pack. The top half looked like nothing until the second from the last card produced this gem. That's more like it! But wait. While this is a White Sox card, Javier Vazquez was shipped off to Atlanta on December 4, 2008. That's a bit of cruel irony. I'm getting closer, but I'm not completely satisfied. The second half of the first rack pack resulted in a whole lot of nothing. Bring on the second rack pack! The second rack pack started with an Andrew Miller, then revealed this beauty. #149 - Juan Uribe That's more like it!! Oh... wait. Juan signed a minor league deal with the Giants on January 29, 2009. I can't really seem to win here. Six cards later appeared this familiar sight. My first White Sox related double in 2009. Oh brother! The rest of the compartment resulted in no further White Sox related cards. The last compartment of the last rack pack started out with one of Kenny Williams former wish list occupants, Andruw Jones. Then three cards down came the first card of a current White Sox player. #154 - A.J. Pierzynski Finally! The rest of the rack pack gave me nothing in the way of White Sox related cards. This is why it is a bit complicated. Five cards, four players, two former players, two current players, one multi-team card, one current player regular card. Oy vey! Is this a sign for how things will be this year? I was happy to receive a package from the UK in the past few weeks. I wasn't expecting anything from The Pursuit Of 80's(ness), but then again, I'm never waiting on pins and needles for those packages. They show up unexpectedly, just when I need them most. Along with the protective envelope upon envelope method of packaging, there was a note. Really sorry!, but I have been really trying to get hold of some White Sox for you. Luckily I was able to pick up a nice game used (black which is little unusual) hope you enjoy. No apologies necessary, John! I'm still gathering cards for your next package to be sent out. I agree, the black game used is a little unusual. It's nice to see it though! I was treated to almost forty years worth of cards, in one small package. How convenient! I have to say, John, that you outdid yourself! I can't believe how many great cards are in this one mailing. Thank you! When I have a few more cards to send out, you will definitely be getting a package! Besides, who can argue with a package that includes Nellie Fox and Goose Gossage? Could Third Be Dayan Viciedo's? Now that Joe Crede has signed an incentive laden contract with the Minnesota Twins, could this mean Josh Fields demotion? It certainly isn't out of the realm of possibility. While you are scrambling to connect the dots, let me explain. Joe Crede will potentially be playing with a division rival. If his back holds up, he will be playing many games with a division rival. Frankly, I don't see that bad back playing too many games on that artificial surface, but the opportunity is there. Josh Fields has been playing under Crede for the better part of two years. This would have given Crede an advantage to study the work ethics and fielding habits of Josh Fields on a level that no game tape could possibly provide. If Josh hasn't changed his fielding drastically, the Twins could exploit those habits whenever they played the Sox. Josh has been working extra hard this offseason and is said to be a completely different player. On the other hand, Dayan Viciedo has not been seen by too many organizations yet. If he is half as good as the White Sox claim, Dayan should have no trouble fitting in on the major league level. Does that mean that Dayan will get the nod over Fields? No, but it is a factor to think about during Spring Training. I wouldn't be surprised if that has already been discussed internally with the White Sox. Dayan could have a greater impact on the Sox than Alexei Ramirez did in 2008. 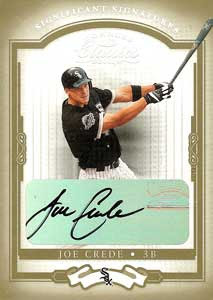 Whatever happens, I wish Joe Crede the best of luck in Minnesota. That is all the luck when he's not playing the White Sox. Another piece of the World Series team is gone. I was skeptical when you took over for Letterman, but you proved yourself with every show. You found your own way and developed your own sense of humor. Letterman even bridged the gap by publicly approving you. That was enough to put me on board. I always thought that Letterman should have gotten the Tonight Show gig. I never found Leno funny. There used to be this show that would run in the mornings on Comedy Central. I don't remember the name, but the object of the game was to not laugh while a comedian was going through a routine a foot from the contestant's face. I managed to always crack a smile or laugh with every comedian except Jay Leno. I was always able to hold a stone face when he would go through his routine. I still think of Doritos when I see Leno. Neither his act or Doritos are funny, in my opinion. The only thing that makes me smile on Leno is the Headlines bit. Any chimp can hold newspaper clippings for a laugh. I am a huge SNL supporter, but I rarely found Jimmy Fallon funny. There's just something about a performer who can't keep it together in any live sketch that annoys the hell out of me. I'm ashamed to admit that I own the "best of" Jimmy Fallon SNL on DVD. It is the SNL disc that gets the least amount of playing time. I think I'll be switching over to Craig Ferguson at that hour. I was glad to hear that Conan won't be changing much. I'm hoping that he brings the same type of humor along with him to California. There should be room at that hour for the masturbating bear and other blue material key to Conan's late night success. Good luck to Conan at the Tonight Show. 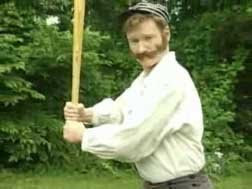 While this really has nothing to do with baseball or baseball cards, at least I was able to dig up a photo of "1864 baseball" Conan. Of all the different ways that I was introduced to vintage designs, these cards have to be the most memorable. Sure, things are exciting when you find out about cards from before you were born, but there was just something about holding cards with those designs in your grubby little hands that made everything come alive. I would sometimes pick up the baseball card magazines just for the insert cards. One of my favorite publications for doing that was Baseball Cards Magazine. Not only did they include designs inspired by older Topps designs, but the entire magazine was a pretty good read. The cards were just changed enough, not to be a complete rip off. There is no mention of where the design came from, on the card itself. It even has a copyright date linked to the magazine on the back. With Topps lawsuit happy, I'm surprised that the magazine was able to get away with putting out the Topps designs. Just in the stack I received from Greg, there were designs liberated from 1959, 1968 and 1970 Topps cards. I seem to recall having cards based on 1960 Topps cards, in the past. I miss picking up baseball card magazines just for the special cards. They didn't have to be perfect. They just had to show my favorite players or a hot rookie and I would be satisfied. The more I collect the past, the more I realize that those days are gone forever. I still have my memories and that's something. I'm slowly getting back into the swing of things. So, let's start off with a package that I received during my stay in limbo. This package came all the way from New York. Greg, from Night Owl Cards, liked what he won in a contest of mine, that he felt compelled to send me some cards. I can live with that. In fact, it was packages like this that kept me sane through my exile. Anyhoo, Greg sent over some definite winners. He gets points (like the meaningless, but well intended points on Whose Line Is It Anyway) for sticking mostly to my want list. Let's see what arrived, shall we? UH324 - Ken Griffey Jr. Awesome cards, Greg! Thank you for the cards and the note congratulating me on the 1,000th post. I'm not sure what I would have done without packages like yours in the past month. Hopefully, I will never have to experience a lack of internet for that amount of time. Since my time online is limited right now, I'll be brief with my answer to the fourth blog bat around. I won't spend as much time delving into the hows and whys of the answer, but I'll try to provide my reasoning nonetheless. Which recent baseball card will be valuable in ten years? 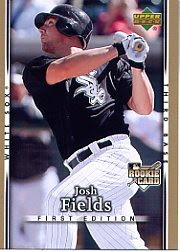 I'm going to go out on a limb here and say that the Wal-Mart variation of the 2007 Topps #292 Josh Fields card would be the card I would invest in. I haven't seen many and I believe that Josh is about to come into his own soon. Being the rookie card and a believed to be rare version of the rookie card, this should be one of the smarter pickups. Even if Josh's career doesn't pan out, it's still a rare variation of that rookie card. It has two fail safe options to support it. The set that I believe will be valuable in ten years would be the Topps Heritage series. The retro look and the attention to detail make this a good investment. It looks like nothing else in the hobby today. What is an absolute "buy and hold" baseball card? Any 1952 Topps cards would be at the top of my list, especially the high series. Any card from 1956 or earlier would be a great investment. I have a feeling that the lesser known brands from before 1957 will start to get their dues. Familiar names like Leaf and Bowman should start to gain interest. Let me tell you, switching ISPs can be a real ordeal. In order for me to secure an instillation date for a combo package that will upgrade everything in the house, and cost half as much, I had to have the line free of any provider. I've been with AOL since 1997, in the days of 33.6. I went with them when they went to high speed. I switched over to the recommended provider when they terminated that service. I've had no problems, in all that time, until the past few months. AOL took seven days to let me out of their system, although it only took them one day to cut off service. I got a date secured for the instillation of the new system. It was originally supposed to be March 13, but we called back and found a date of February 18. At which time, I'll be on fiber optic lines. For all my trouble, I was told that I could work something out for free DSL, by the salesperson. That turned out to be untrue, so the upcoming review will be less than favorable. Instead of wasting money on DSL for less than two weeks, I've decided to wait. Thank you for being so patient with this blog and the other blogs that I contribute to. Things should be back to normal around the 18th. All expected packages will be mailed when I get fully back online.